I do my best to make good choices about the food I buy. I don’t eat a lot of meat, and I don’t eat any red meat. But, I can always try to do better. The new book Living the Farm Sanctuary Life is full of inspiration for eating better, taking better care of the planet, and paying more attention to how animals are raised. I received a review copy. It’s doesn’t beat you up about how you choose to eat. It just tells the story of Farm Sanctuary and how they’ve rescued animals and inspired a lot of people to stop eating animal products. There are charming anecdotes about the animals that have been saved, nursed back to health, and gone on to delight everyone who gets to know them. There are reminders about the horrible conditions at factory farms and suggestions for making small changes that will add up. I started thinking about how my consumption of espresso drinks with milk has increased over recent years. In the past, I drank tea more often. I decided it’s time to switch back to more tea and less dairy and to make sure I’m visiting coffee bars that use milk from good sources when I do need a cappuccino fix. I’m also thinking that fewer turkey sandwiches and more sandwiches filled with vegetables would be a good change. Following the stories about the animals and the farm and tips for healthy eating, there are recipes for Breakfast, Salad, Handheld Meals, Soups, Appetizers and Sides, Entrees, and Desserts. And, they’re all free of animal products. Some dishes I want to try include: the Tacos with Salted Grilled Plantains, Salsa Verde, and Pepitas on homemade tortillas; the Spring Vegetable Cioppino; and the Savory Wild Mushroom Crepes with Roasted Fingerling Breakfast Potatoes made with chickpea flour in the crepes. I jumped right into the Grilled Thai Cabbage Salad before our local cabbage disappears for the summer. 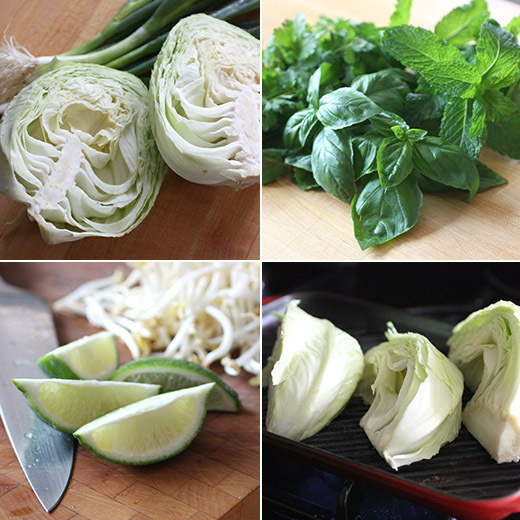 The salad itself is an easy mix of a few vegetables and lots of herbs, and the grilled cabbage adds a lot of flavor. But, the real star here is the sauce. I want to keep a bowl of it handy for dipping all kinds of vegetables or grilled tofu. It’s made in a blender by combining almond butter, lemon juice, rice wine vinegar, chopped fresh ginger and garlic, a chopped serrano chile, some tamari, and a little water and pureeing until smooth. You can add more water as it purees to get the consistency you’d like. Meanwhile, the cabbage was cut into big wedges and drizzled with oil. I grilled the wedges inside on a grill pan, but the flavor of grill smoke would have been even better for it. The wedges were only grilled for a few minutes per side to get some marks and to allow the cabbage to just begin to take on some tenderness. After removing the cabbage from the grill pan and letting it cool, it was chopped into chunks. 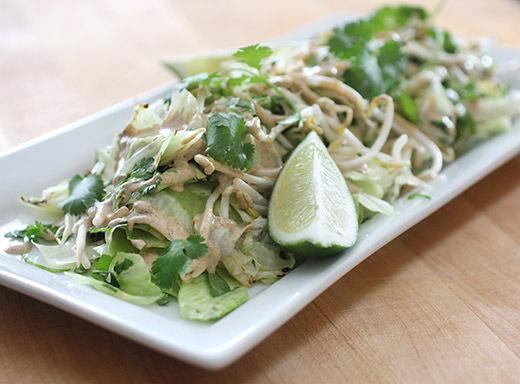 The cabbage was tossed with chopped mint, basil, cilantro, and bean sprouts and green onions. It was served with the sauce drizzled over top. 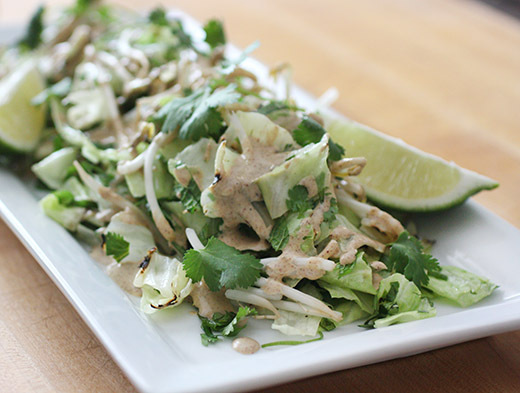 I always love a peanut sauce, so I suspected I was going to enjoy this almond sauce on the salad. In fact, I might have liked it more than any variation on peanut sauce I’ve made before. The lemon juice was the magic ingredient, and the serrano gave it just enough heat. The salad was fresh and full of flavor from the herbs, and the charred cabbage added an earthy note. With dishes like this, eating all plant-based food is easy. I like the idea of cutting back on sugar. I’ve been doing just that for a while now. I’ve been baking fewer sweet treats and looking for ways to incorporate natural sweeteners other than refined sugar. So, I was delighted to find out that Joanne Chang’s newest book is all about Baking With Less Sugar , and I received a review copy. She set out to recreate some of her favorites using much less or in some case no refined white sugar. There are no manufactured sugar substitutes here, just reductions in total sugar used or appearances of honey, maple syrup, molasses, or fruit for sweetness. And, something I love about Joanne Chang is that she always gives you the facts about how and why recipes work. There are a few pages at the front of the book with explanations about what sugar does in baked goods and how it affects browning, texture, coagulation of proteins, etc. It makes it clear that you can’t just eliminate sugar and expect to get the same results as when it’s used, and there are reminders about these facts throughout the recipes. I marked a lot of pages of things to try while reading this book. Almost every page of the Just Chocolate chapter has a flag on it, and I’m not even a serious chocoholic. These recipes highlight the sweetness already found in chocolate and have no additional sugar. Double-Chocolate Whoopie Pies, Chocolate-Fudge Bourbon Ice Cream, Mint Chocolate Ice Cream Sandwiches, and Mocha Shaved Ice with Vanilla Cream all got my attention. I already baked the Peanut Butter Honey Cookies with oats and chopped peanuts. They’re made with natural peanut butter, butter, and honey with no sugar added. The cookies were nutty and perfectly sweet enough and very tender. As warned in the recipe headnote, without the sugar these cookies are soft and cake-like rather than crispy or chewy. They might not hold up well for packing and sending, but they were great for snacking right at home. Next, I had to try the Honey Cashew Morning Buns. Again, this recipe had no refined sugar. The yeasted dough for the buns contained no sugar or honey, and the sweetness all came from the “honey goo” in which the buns were baked. 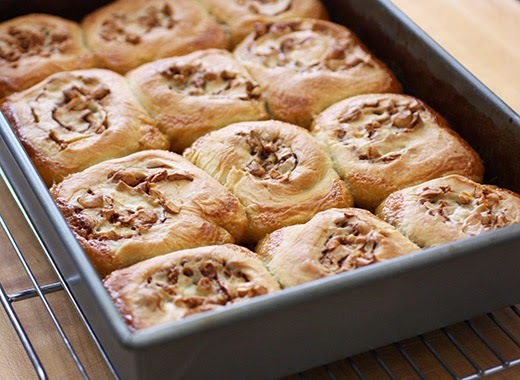 This is a lightened-up version of the famous Flour Bakery sticky bun. The dough was made in a stand mixer with water, yeast, flour, salt, and olive oil. It was covered and left to rise for a few hours. Meanwhile, cashews were toasted and chopped for the filling. The filling was a mix of softened butter, cinnamon, and the chopped cashews. The risen dough was rolled into a square, and the filling was spread across the surface before the dough was rolled into a jelly roll. I cut the individual buns and chilled them in the refrigerator overnight. The next day, I made the honey goo which included melted butter, honey, heavy cream, water, and salt. Once cooled to room temperature, the goo was poured into a baking pan and the rolls were set into it. They were left for a second rise for about an hour or so before baking. The finished rolls need to be served warm so the sticky glaze can be scooped up with each one. The rolls were decadently gooey in the best way. There was plenty of sweetness from the honey and lots of great flavor from the cinnamon and nuts. I can’t wait to try all those chocolate recipes, but the Pineapple-Coconut-Banana Sorbet sweetened only by the fruits in the recipe is a top contender to try next too. Looks like we might start having dessert more often than we have been lately around here. Recipe reprinted with publisher's permission from Baking With Less Sugar . Our famous sticky bun at Flour is unapologetically sweet. It’s drenched in a brown sugar-honey “goo” and chock-full of cinnamon sugar and pecans. Not only did it beat Bobby Flay in a Throwdown episode on the Food Network, he also graciously picked it as his choice for The Best Thing I Ever Ate in another TV show. It has become a signature item, and it has put us on the map. I confess that I can only eat a few bites and then I’m done. It’s incredibly rich, which is what makes it so good, but I longed for something just as decadent but in a lighter, less sugary way. These morning buns are the answer. 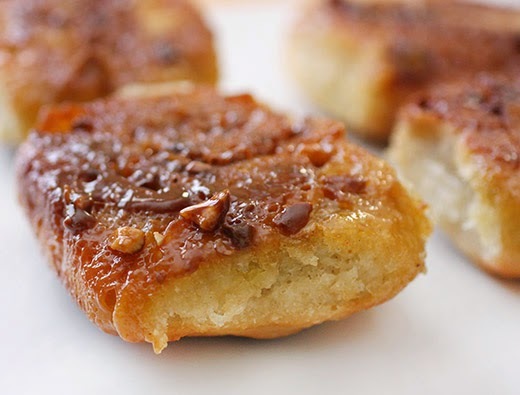 Made with a light, yeasted, unsweetened dough, they get filled with chopped cashews (my favorite nut) and then baked in a honey goo that is rich with cream and butter, and sweet with a little honey, but not so much that they hide the flavor of the bun or cashew. I especially love the caramelized pieces on the edge of the pan. 1. To make the dough: Lightly oil a large bowl. 2. Using a stand mixer fitted with the dough hook attachment, combine the water and yeast and let sit for 20 to 30 seconds to allow the yeast to dissolve and activate. Dump the flour and salt onto the yeast mixture, and carefully turn on the mixer on low speed. Let the dough mix for about 10 seconds. (To prevent the flour from flying out of the bowl, turn the mixer on and off several times until the flour is mixed into the liquid, and then keep it on low speed.) When the dough is still shaggy looking, drizzle in the olive oil, aiming it along the side of the work bowl to keep it from splashing and making a mess. 3. With the mixer still on low speed, knead the dough for 4 to 5 minutes, or until it is smooth and supple. The dough should be somewhat sticky but still smooth, and have an elastic, stretchy consistency. If it is much stiffer than this, mix in 2 to 3 Tbsp water; if it is much looser than this, mix in 2 to 3 Tbsp flour. 5. Meanwhile, make the honey goo: In a medium saucepan, melt the butter over medium heat and whisk in the honey, cream, water, and salt. Remove the pan from the heat and let the goo cool for about 30 minutes before using, or until room temperature. The goo can be stored in an airtight container in the refrigerator for up to 2 weeks. 6. To make the filling: Place a rack in the center of the oven and preheat to 350°F [175°C]. Put the cashews on a baking sheet and toast for 8 to 10 minutes, or until lightly toasted. Turn off the oven and set the cashews aside to cool. 7. Punch down the dough to deflate it—literally give it a punch in the center of the puffy dough, which will allow you to roll it out more easily. On a floured work surface, roll out the dough into a 12-in [30-cm] square about 1/4 in [6 mm] thick. It will be a bit stretchy and it may spring back, but keep rolling gently until it roughly holds its shape. 8. 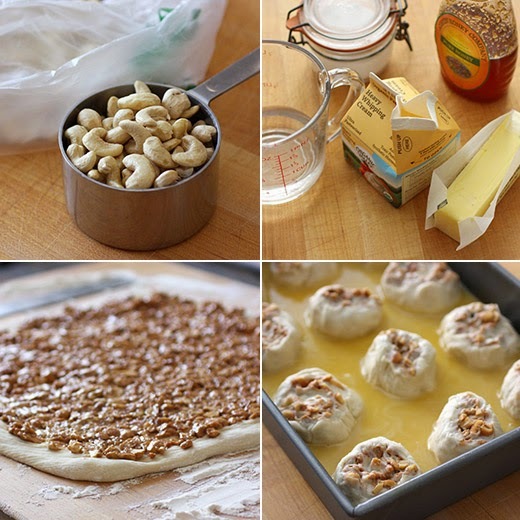 In a small bowl, with a wooden spoon, mix together the butter, cinnamon, and cashews. Spread this mixture evenly over the entire surface of the dough square. 10. Pour the goo into a 9-by-13 in [23-by-33 cm] baking pan. Place the buns in the pan, evenly spaced. If some of the buns have become oblong or oddly shaped from the cutting and moving around, feel free to arrange them once they are in the pan into round spirals. Cover the pan loosely with plastic wrap and let the buns proof at warm room temperature (78 to 82°F [25 to 28°C] is ideal; an area near the stove or in the oven with only the pilot light on is good) for 1 to 2 hours, or until the dough is puffy, pillowy, and soft and the buns are touching. 11. About 15 minutes before the buns are ready to bake, place a rack in the center of the oven and preheat to 400°F [205°C]. 12. Bake for 40 to 50 minutes, or until the buns are pale and light golden brown. Remove from the oven and let cool in the pan on a wire rack for 10 to 20 minutes. I was immediately intrigued by the new book Steeped . I love tea. I drink tea often and have cooked and baked with tea as well, and now here was a book full of “Recipes Infused with Tea.” I received a review copy. What I quickly realized as I started reading the book is that not only is it full of clever uses of tea in all kinds of different dishes, it’s also full of just really delicious-sounding food. The Green Tea Noodles in Asparagus Sauce with Goat Cheese Pearls has a couple of genius things happening in the same recipe. The fresh pasta is made with matcha green tea powder mixed with the spelt and all-purpose flours. And, the dish is served with goat cheese pearls made by rolling little pieces of goat cheese between your palms. They make the prettiest garnish. The Iced Tea Sugar Cookies are made with five options for glazes, and each glaze is made with a different type of tea. For instance, the Mojito Glaze calls for Moroccan mint green tea and lime zest, and the Rooibos Carrot Glaze has rooibos tisane and finely grated carrot. I first learned about tea leaf salads when I read the book Burma, and this book includes a fabulous, big, composed, California-version of a tea leaf salad with chopped avocado, jalapeno, and sunflower seeds. There are also really lovely pairings like the Jasmine Tea Whipped Cream with Shortcakes topped with Canteloupe. I can already imagine how good sweet, ripe cantaloupe will be with the flavor of jasmine tea. This is definitely so much more than a darling, little book about tea. First, I had to try the Roasted Tomato Tea Toasts and experiment with the smoky flavor from lapsang souchong tea. You begin by grinding lapsang souchong tea with coarse salt in a spice grinder. It results in a smoky-flavored salt accented with the floral qualities of the tea. This salt was sprinkled on tomato slices before they were roasted. I had just received some tomatoes from our CSA, and I bought some extras at the farmers’ market. This happened two weeks ago, and at that point, our local tomatoes were of the greenhouse variety. They were good candidates for roasting to concentrate their flavors. 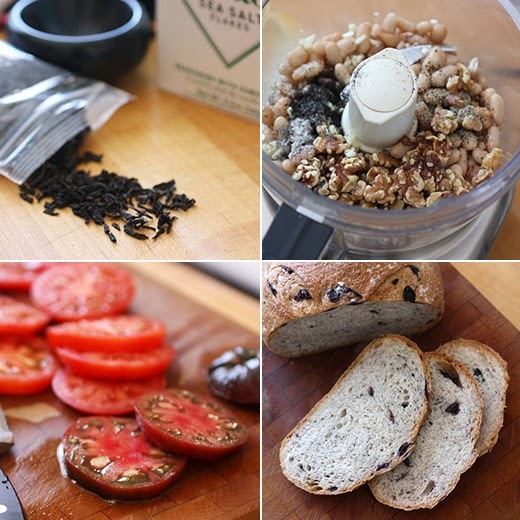 While the tomato slices roasted, white beans, toasted walnuts, minced garlic, more ground lapsang souchong tea, and some of the tea salt were pureed together in the food processor. Olive oil was drizzled in until the puree was smooth. Last, olive bread was sliced and toasted. I cut the bread to about the size of each slice of tomato. 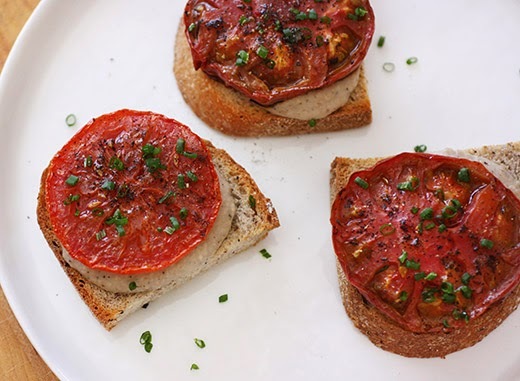 The bread was topped with the white bean puree, then a slice of tomato, and chopped chives. These tea toasts were so simple to prepare, and the result was a delightful and unique flavor experience. The lapsang souchong salt is just smoky enough without being overbearing as some smoked salts can be. 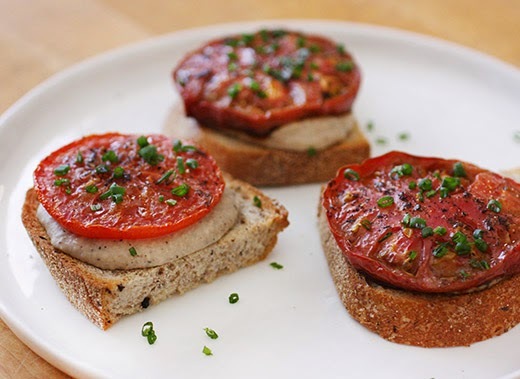 It combined perfectly with the white bean and walnut spread, and the roasted tomatoes on top. I love now having the idea of this tea and this salt for adding a hint of smokiness in my bag of tricks, and I look forward to using tea in even more new and different ways. I was delighted to learn about the newest book from Maria Del Mar Sacasa. Her last one was Winter Cocktails, and I’ve had so much fun trying different, boozy versions of hot chocolate and other warming cocktails for cold weather. This new book is the opposite. It’s Summer Cocktails , and I received a review copy. It’s full of refreshing, iced, chilled, and frozen cocktails to enjoy in the summer sun. I’m fascinated with the Shrub Cocktails made with homemade fruit vinegars combined with gin, sparkling wine, or vermouth. I can’t wait to try the recipes for the shrubs like blackberry-basil, rhubarb-plum, and strawberry-rosemary. There are also recipes for infused liquors like Black Pepper Gin or Vodka and Chiquila which is morita chile- or chipotle-steeped tequila. The Black Pepper Gin is used in a Moroccan Mint Iced Tea cocktail among others, and the Chiquila appears in several drinks including the Pulparindo with tamarind concentrate and grapefruit juice. There are Punches and Pitchers for parties and Frosty Drinks where I could easily focus my attention until fall. The Luxe is a vanilla milkshake made with fresh cherries and Luxardo maraschino liqueur, and the Watermelon Refresher is poured over frozen watermelon cubes. There are even boozy popsicles. Yes, I believe this book will stay close at hand throughout this summer. 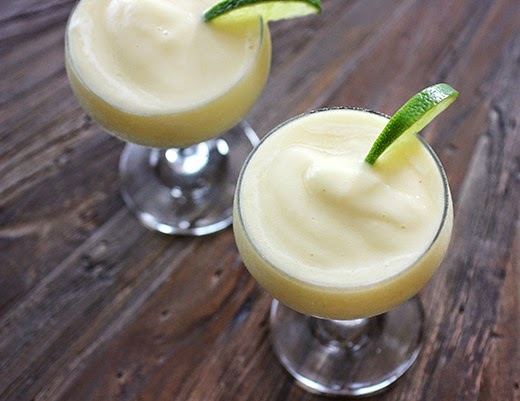 With Cinco de Mayo just a couple of days away, a tequila cocktail seemed appropriate. So, first from the book, I tried The Penelope. If you start with a fresh pineapple, you need to plan ahead since frozen chunks of pineapple are what are needed here. 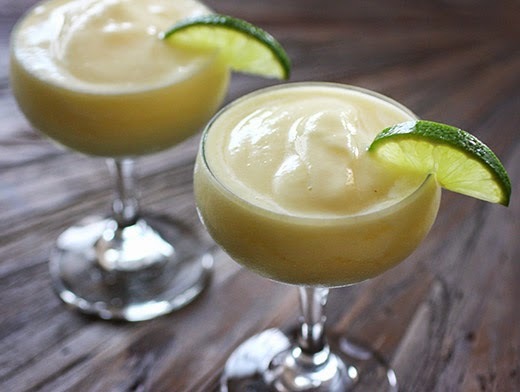 This is a smooth, frosty cocktail pureed in the blender. 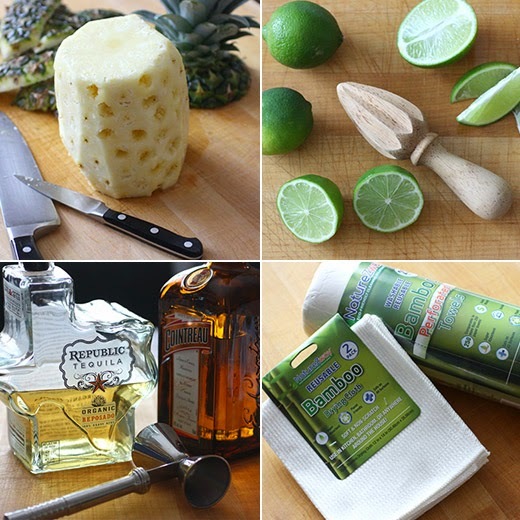 Frozen pineapple is combined with tequila, Cointreau, lime juice, and simple syrup to taste. The pineapple itself was sweet enough for me, and I didn’t add any extra sweetening. Once pureed, the mixture was served with a garnish of lime. I had just received a couple of samples from NatureZway which came in very handy. I always spill and dribble liquor all over the counter when I’m measuring for cocktails, and it’s great to have extra bar towels. I received two bamboo cloth towels and a roll of heavy-duty bamboo paper towels. The paper towels are sturdy enough for serious cleaning, and the eco-friendly bamboo cloth towels can be washed and reused for years to come. I’m actually looking forward to a scorcher of a summer this year. The hotter it gets, the more reason I’ll have to keep making different icy cocktails. From Iced Coffees with Kahlua in the morning to Pimm’s with Strawberry Vodka in the afternoon, it might not be a productive summer but it will be delicious.